________ I would like to purchase a bagged lunch from the cafeteria for $2.35 from the cafeteria for my child. (If your child receives free/reduced lunches, he or she will get lunch for the free or reduced price. Please send the money to school ASAP if your child doesn’t already have money in his or her lunch account. Over the past two weeks, we worked on one part of our Biology unit of study. 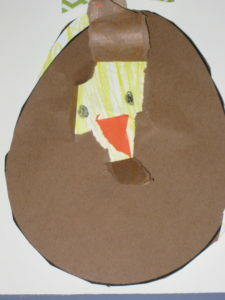 Kindergartners learned about oviparous and viviparous animals. 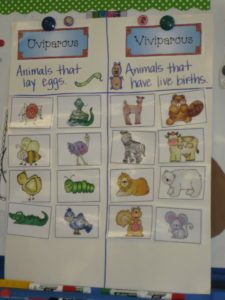 Oviparous animals lay eggs and viviparous animals have live births. We listened to a book on YouTube called Chickens Aren’t the Only Ones by Ruth Heller and followed up by sorting pictures of animals into the two categories. As the students were sorting, they had to tell us which category the animal belonged in and why. 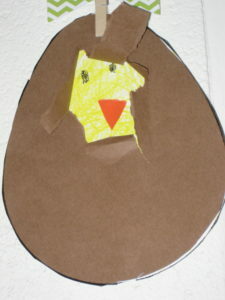 We connected it to writing by writing about an oviparous animal of their choice. 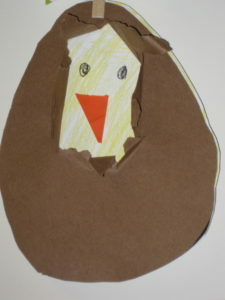 Leading up to spring break, we discussed the Life Cycle of a Chicken, watched a short video showing the life cycle, and made a hatchling craft. Want to learn more? Did you know that there are two kinds of mammals that lay eggs? They are the long-nosed spiny anteater or echidna and the platypus. Check out this website to see a picture of these animals and/or learn more about them. During the Week of the Young Child, we recognized the young learner in all of the students by doing short, focused activities each day. A summary of the week is below. On Music Monday, the students participated in some musical movement activities. They danced to Kids Bop songs, particpated in GoNoodle activities, and even had some special requests for songs to listen to at dismissal time. For Tasty Tuesday, we discussed healthy food choices and tasted a variety of foods. The kids tried gluten-free garlic and herb sprouted seed crackers, dark chocolate pretzel crisps, and regular pretzels. All of the kids were encouraged to take a courtesy bite (as we call it at my house) and most tried everything! We talked about how it’s okay if they didn’t like it but they should at least give it a try. Most of the kids found that they liked something that they thought they wouldn’t enjoy! On Work Together Wednesday, the kids were given various tools to build something. They had to pick a partner, develop a plan of what they wanted to build and then work together to build it. They had so much fun being creative! The kids were so happy and their smiles were priceless. We will definitely find time for Work Together Wednesday another day in the future. For Artsy Thursday, each student decorated one white bag any way they wished. The bags were then connected together to create class flowers. It’s always so fun to take the time to celebrate being a young learner! April – PTO will be providing pencils and chewing gum to those students taking the PSSAs. April 17th – Box Top collection date. Send in all of your box tops. Ask your friends and family near and far that don’t have a child in school to save them for you! April 17th – 4-8pm Tropical Smoothie Luau. Join the fun at Tropical Smoothie in Millersville. Free lei and door prizes. Mention Martic when ordering and we get a portion of the proceeds! May 6th-10th – Staff Appreciation Week. Check the blog for a sign-up link for donations. Remember to send in thank you cards for teachers and staff! May 7th – Olympic Day for students in grades 3-6 in the morning. Awesome Activities Day for students in grades K-2 in the afternoon. Check the blog to sign-up to help out at the stations. PTO will provide a water station and freeze pops. May 9th – Honey Bee Assembly. PTO pays for this event. Volunteers are needed. Call the office for details. May 17th – Spring Fling from 5-8pm. Free food and drinks. Lots of fun games. BOGO Book Fair. Raffle Baskets. May 23rd – Spring Scholarships. Martic provides 2 $500 scholarships to graduating Martic students. Spring Field Trips – PTO pays for busing and a portion of the entry fee. Thank you PTO! June 5th – Last Day of School. Schools out for summer! End of year staff luncheon. Register your gold cards at Mussers and your Giant card under community rewards – link to Martic. Our school district is once again partnering with the Lancaster Public Library to allow kindergarten students to receive their very own library card! You will be receiving an application in your child’s STAR folder to fill out if you would like your child to receive his or her own library card. Also, in the coming months you will find out more information about other reading programs and incentives that your child can participate in over the summer. Please return the application form back to school by April 30th. Your child will receive his or her card in May along with a book to keep!